I met Shane Ormond through the local comic creator meet-up. I did some lettering for him on a short-lived three-panel gag strip in a local magazine. After that, I edited a couple of short scripts of his that were published in local comic anthologies. Later down the line, I ended up editing “The Guards”, a 48-page comic book he wrote, which was published earlier this year. You can buy a physical copy online here. To date, The Guards is probably the comic I am most proud of making. Having edited most of Shane’s recent comic work, I like to take full credit for all of his writing successes, including any and all in the future. Charlie Aabo on the other hand, is someone I have learnt a lot from, so no doubt he will be taking credit for my success, whenever that happens. He studied, and later taught at the Joe Kubert school, and probably has more years of experience in making comics than I have reading them. His work has energy, comedy, and character that you rarely see individually, let alone all poured together into one page from the pen of a single creator. Having him on the site is an honour. So anyway, about two months before Christmas last year, I emailed a few friends whose work I admire, asking them to help out on the site over Christmas. Shane got back to me just before deadline with a really unusual script. It had absolutely nothing to do with board games, and was entirely the most bizarre pitch I received. I turned it down, but it wouldn’t leave my head. After turning it over in my head for a week, I realised I had turned it down for all the wrong reasons. “It didn’t suit the site”, “it wasn’t what the readers would want”, “the audience might not like it or get it”. All terrible, terrible reasons to have broken Shane’s poor, delicate, writer’s heart. I was second-guessing the audience, and afraid to take a risk. The script really made me laugh, and it was completely ridiculous. That was all that should have mattered. By trying to second-guess the audience, I was doing them (you) a disservice. After changing my mind about running the comic, I discussed it with Aileen, and we decided it would really need the right artist to work. It would not even be worth attempting without someone who could match perfectly its wonderfully absurd tone. There was only one name that fit that bill, and I decided if I couldn’t get Charlie I wouldn’t run the comic – that’s not an exaggeration to flatter, it’s just the truth of the matter. By the time we had zeroed in on Charlie as our pick for artist, it was too late to use the comic for Christmas. But I liked it enough asked Charlie to have it in for this year, and as luck would have it, 12 months was just about enough time for him to find the time. Maybe you will love it, maybe you will hate it, maybe you will scratch your head and wonder at the lack of dice and meeples. Either way, I feel I made the right call, but would nonetheless love to hear your thoughts on it. I am a regular since the blog started, and I fancy your usual strips, along with all their sillyness and geekyness and “relationship-jokes”, very much. But don’t be afraid of the unexpected! The strip above is funkin’ genial! Love the Godfather reference, and the stylish art too. Reminded me of Perry Bible Fellowship a little. Shane & Charlie: congratulations, you are part of the Family now! We expect regular board game related (or not!) webcomics from you. Thank you so much for the kind words about the comic. Glad you enjoyed something a little different this week as well. I love hearing from people that follow the comic every week – encouragement like that is what keeps us going. I always look forward to this comic/blog on Friday mornings and this didn’t disappoint. 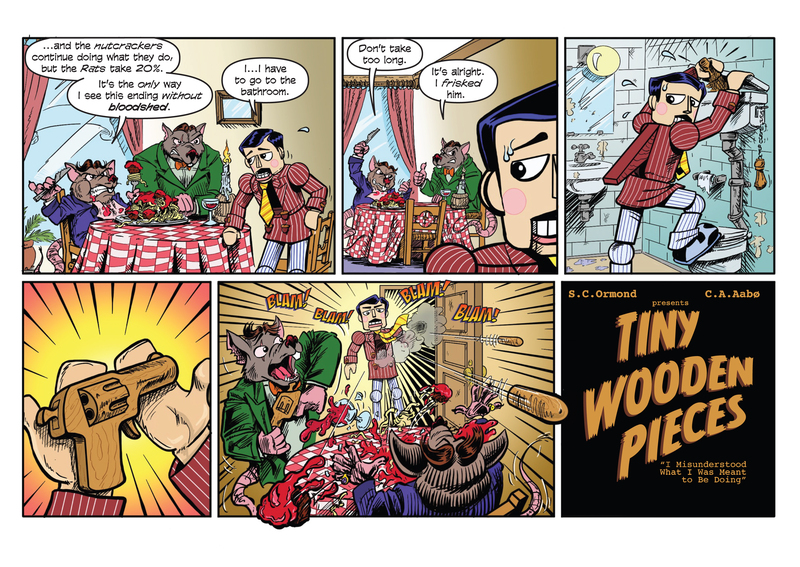 I’m ready to back the ‘Nutcracker and Rat Mafia Wooden Pieces’ boardgame when it hits Kickstarter in 2017 as well. That would be amazing! I would actually love any board game with artwork by Charlie. Also, thank you for the support and the kind words. You have no idea how much hearing things like that mean to us, honestly. It’s made my day. Hold everything! Charlie just told me he DID illustrate a board game. I’ve known him for years, and he has NEVER mentioned this. Only available in Norwegian – his country of origin. Ok, I have to admit I was scratching my head as the joke just went over me. Then I read the comments. Still nothing. Then I reread the comic. Still nothing. ( I know, right) and then I reread it slower, (and the title) and it hit me like a ton of bricks and I couldn’t stop laughing. This is flipping AWESOME! I definitely encourage more of this and I promise I’ll try not to be so dense going forward. You are right! Maybe we should explain the joke for anybody who does not get it? The comic is technically festive/seasonal due to the inclusion of the ‘nutcracker’ as the wooden toy mafia soldier. I didn’t get this either until Aileen explained it to me – I’m not big on ballet. Glad you (eventually) liked it! I’m so happy about the positive response it’s getting. I mean, I did scratch my head…but I also really liked it! Explanation below, thanks to some diligent readers! Glad you liked it. Thank you! Glad we had some helpful reader explanations at the ready. We have the best readers/commenters! Yourself included, we love the regular commenters!